Nosh Some Khuushuur, Taste the Steppe! Khuushuur. 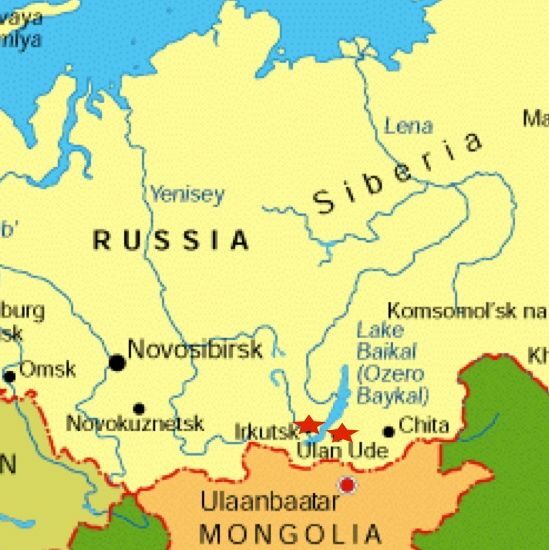 (Who-shúre): the approximate pronunciation of this culinary tidbit from the cooking fires of Buryat Nation here on their home steppe; stretching across recognized international boundaries from Central Siberia down into China and Mongolia. Khuushuur? How good could it be? Well, you consider yourself adventurous, so heck, you decide to order one up. Without delay a piping golden half-moon meat tart is placed before you. It looks OK, I mean Van Gogh isn’t going to go into spasms and rave over it’s appearance, but face it kid, this isn’t art for the peepers, it is art for your tum. And when you bite into it’s crisp yet soft dough, in a moment of intense clarity you will recognize your terrible mistake . . . Only a silly fool orders one! For khuushuur, tucked into with proper timing will make your kisser moon-eyed in desire for more. You will find yourself surreptitiously seeking another cache of these meat pies, desperately eyeing surrounding tables, chairs and purses for the greasy hint that might reveal a secret stash or looked over morsel. Hopefully casting glances toward the dark doorway of the kitchen from which this fried pastry made it’s debut, you will khuushuur to fly in squadrons from the frying pan to land on your plate. Your hand creeps toward your neighbours plate ever-so-imperceptibly to free him of the burden of eating another. Perhaps, that is why Buryats traditionally had knives hanging on chains of silver from their belts, ever within immediate reach in case some coveting hand needed skewering. Aha! I believe I have just stumbled upon the etymology of the word skewer! Who knew the core of its meaning centers around hungry Buryats keeping paws off plates filled with delectable khuushuur? Now I know there are a lot of you somewhere out there that are packing their bags even now, tryin’ to get to the khuushuur. I want you to sit down! Breathe . . . breathe . . . and learn something, mainly cause I don’t want to be gettin’ in fights with you out here in the streets of Ulan-Ude because you are all like “He lied about the khuushuur! I flew eight thousand miles, and got me some clammy uninspired khuushuur!” Let’s just avoid that sticky situation, shall we? As I said above, proper timing is KEY! You have got to get that fresh khuushuur! I made my way to this city in 1999, and let me tell you, I have eaten some poor khuushuur! But I didn’t know. I was ear deep everyday in Russian studies, just trying to keep from telling people I flew here from America on a teapot. (Trust me, in Russian it is hilarious, like fall off your chair and gasp for air in the middle of Russian class hilarious). So when it comes to food, I’m buying what the ladies who set up little food stands on the University grounds are selling. They made it last nite at 7 pm. 7:01 pm is when I should have been on that khuushuur. But at seven O’ one pm, I was trying to round up last nights dinner, not lunch for today! So yesterdays khuushuur becomes my lunch. At that time my culinary interpretation of khuushuur was a brief query in my mind “why do they eat this stuff here?” And then a “beggars can’t be choosers” shrug as I considered the economic state of students in Russia, myself included. OK, I see you didn’t really calm down like I asked. I can see by the burning angst in your eyes, the famished set of your lips that you are dying to know just where to get that fine fresh khuushuur. Let me show you fresh khuushuur central. Voila. This little ger, number 23, is among a hundred here in Dadal, Mongolia. This is khuushuur alley, all these gers are selling them to the revellers and competitors at Altargana 2014. To learn about Altargana, click here. Below from left to right we see Sosfseren, Olgonbayar, and Saruulbayar the owner-operators of this little tent of nourishment. Come on inside with me and have a look at their enterprise. Proprietors of Ger # 23, tasty Khuushuur and whatnot. 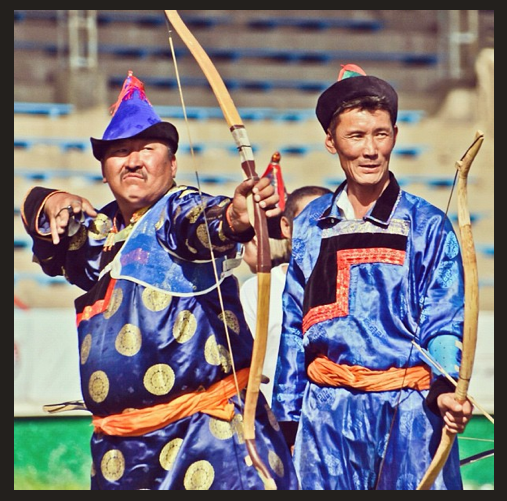 Ganolzii and Mendbayar making that dough! Station #2: This is the meat mixing station. Beef would be the most common meat used in these pies, although you might get on with pork or mutton mixed in. Khuushuur demands a sharp eye, and measurements are strictly adhered too! Here, we get a dash of onions. Gangannavz rounds that meat into shape. Here we have a quick break to check the action in the ger. Some industrious gentleman in brown is making my friend Natasha laugh. Good on ‘im. Station #3: Prep for frying station. Saruulbayar lays out the Khuushuur ready for the frying pot, while his mother applies the needed treatment. Station #4: Frying. The Matriarch of this production manning (womanning?) the fry pot, tea pot and steaming pot, for buuz all with a wry sense of humor. In like 2 seconds it will be THE time to get your teeth around these Khuushuur, which I’m about to do. And they are done. Clear a spot at the table I am diving in! Happy khuushuur noshers. With proper timing to get the freshest khuushuur, this is how good they go down!